An image scanned from a black and white photograph of Belle D'Arcy, an actress who began her acting career in New York in 1895 while studying music. 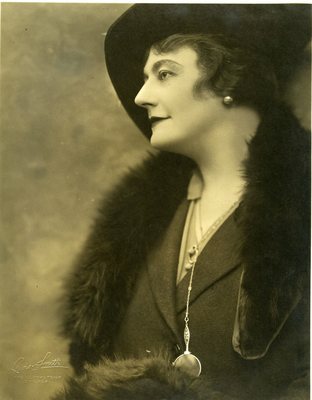 She performed throughout the world for several years and in 1910 she began playing at the Jefferson Theater and Keith's Theater in Portland, Maine. In the 1920s she made a number of tours to Europe and appeared in motion pictures. In 1931 she retired from the stage, but made a number of radio broadcasts with both NBC and CBS. She died in Portland, Maine on November 2, 1936.